Irish-bred Hunt, acclaimed champion grass horse of the 2017 Del Mar summer meeting after triumphs in the Eddie Read Stakes and Del Mar Handicap, returns to the seaside track to seek a second success in the Read Sunday when he heads an outstanding field of eleven turf specialists in the $250,000 Grade II contest. Hunt, who will be piloted by regular rider Flavien Prat, will carry highweight of 124 pounds in the nine-furlong contest over the infield Jimmy Durante Turf Course as he faces stern opposition from several formidable foes, including multi-stakes winner Itsinthepost (122, Tyler Baze), Sharp Samurai (120, Gary Stevens), top three-year-old a year ago after winning the La Jolla Handicap and Del Mar Derby, and Bowies Hero (124, Corey Nakatani), victorious in the Grade I Kilroe Mile in March. Others in the field are Irish-bred True Valour, making his American debut under jockey Jamie Spencer for trainer John Murtagh; Next Shares( Rafael Bejarano), millionaire Flamboyant ( Brice Blanc), Catapult ( Drayden Van Dyke), Multiplier ( Victor Espinoza), Prime Attraction ( Kent Desormeaux) and Fashion Business ( Joe Talamo). According to allowance conditions, all of the aforementioned will carry 120 pounds. 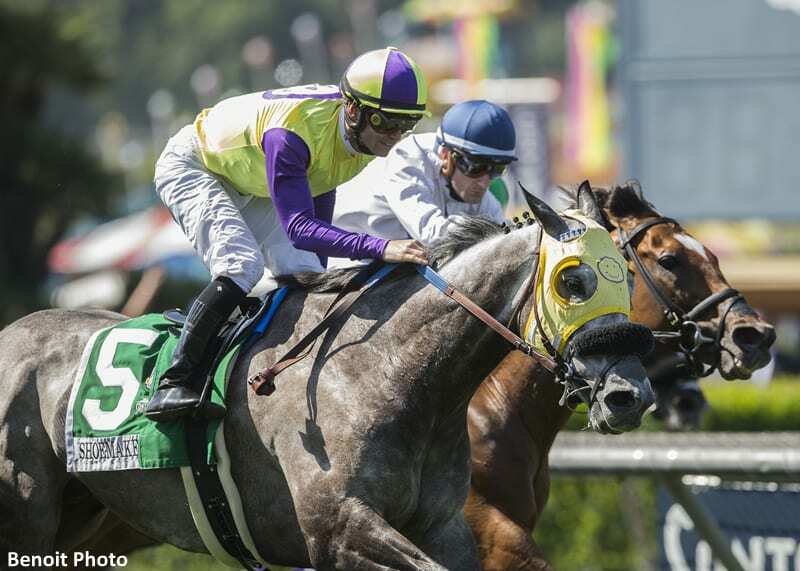 Hunt, conditioned by Phil D'Amato, comes into the Read in sharp form, fresh from a victory in the Grade I Shoemaker Mile at Santa Anita in May, defeating highly-regarded Heart to Heart by a neck, with Next Shares another neck back in third. In his final 2017 race, the son of Dark Angel won the Seabiscuit Handicap in November at Del Mar. Itsinthepost, trained by Jeff Mullins, has won four of his last five outings, including the Charles Whittingham at Santa Anita in late May. Sharp Samurai returned from a six-month layoff to win an optional-claiming race at Santa Anita in handy style, while Bowies Hero was fifth behind Hunt in the Shoemaker Mile after taking the Kilroe previously. Sunday's supporting feature is the $75,000 Wickerr Stakes at one mile on the grass. Entrants in an attractive betting contest are Gold Rush Dancer, Forever Juanito, Cistron, Giant Payday, Editore, Isotherm, Tule Fog, Liam the Charmer, Big Score, Colonist, Conquest Tsunami, Perfectly Majestic, Double Touch and Bombard. Post time for the first of nine races Sunday is 2 p.m. This entry was posted in Racing and tagged bowies hero, Del Mar, Del Mar Handicap, del mar thoroughbred club, eddie read stakes, flavien prat, hunt, itsinthepost, Phil D'Amato, sharp samurai by Del Mar Thoroughbred Club. Bookmark the permalink.